MY3 is available in the Apple App Store and Google Play, free of charge. Click below on your preferred mobile application provider for instructions on how to download MY3 to your mobile device. Add the contact information of the 3 people you feel you would like to talk to when you are having thoughts of suicide. Customize your safety plan by identifying your personal warning signs, coping strategies, distractions and personal networks. This safety plan will be with you at all times and can help you stay safe when you start thinking about suicide. Learn more about safety planning. Hold all your resources in the palm of your hand. Whether you're a veteran, want support from your local community, or want to learn more about suicide prevention, pick the resources that best support you. Get support at times of greatest risk. When you're having thoughts of suicide and it feels like there’s no hope in sight, find support at your fingertips at any time of the day. 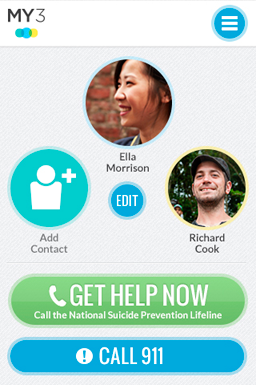 Access the National Suicide Prevention Lifeline 24/7. A trained counselor from a crisis center near you can be reached 24 hours a day, 7 days a week. Anyone can call, whether you’re concerned for yourself or someone else. If you need someone to talk to, the National Suicide Prevention Lifeline is always ready for the call. MY3 could really help you if you're feeling suicidal and need support to stay safe.